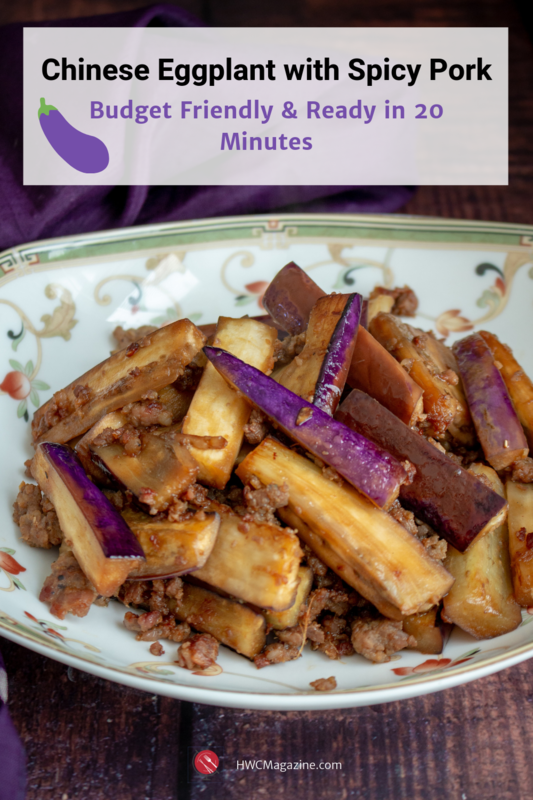 Chinese Eggplant with Spicy Pork is a quick and easy, less than 30 minute, LOW CARB recipe that is WAY better than Chinese take out. Budget Friendly and Delicious! 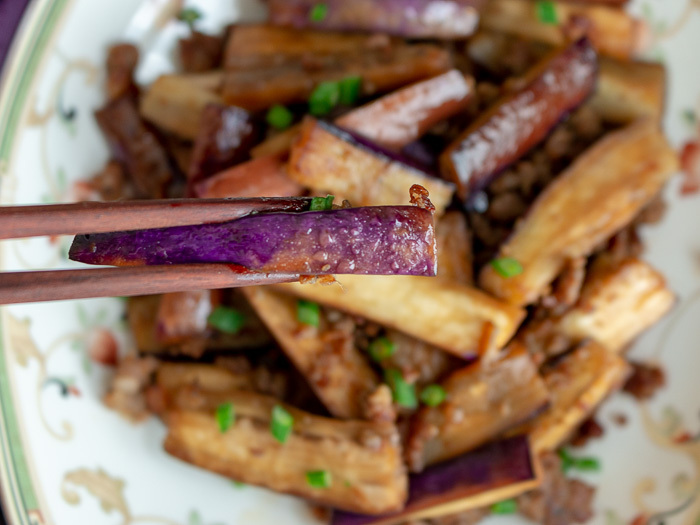 You are going to love Chinese Eggplant with Spicy Pork because the eggplant are crispy on the outside and tender on the inside. In addition, the spicy minced pork is full of garlicky spicy flavor to bring the whole dish together. What's the Difference between a Chinese and Japanese Eggplant? Have you ever tried a Chinese or Japanese eggplant? They are long thin purple eggplants that have thinner skin, have less seeds and are less bitter than the round Italian eggplant. However, it is difficult to discern the difference between a Chinese and Japanese eggplant. Japanese eggplants are deeper in purple color. Whereas, Chinese eggplants are a little lighter purple and sometimes a little longer. This one has the oddest curve to it but firm and ready to eat. Either a Chinese eggplant or a Japanese eggplant both work well in our Chinese Eggplant with Spicy Pork. Do you dread grocery shopping? The part we dread about grocery shopping is the cost and keeping it within budget. It can be difficult. However, hands down vegetables are most generally speaking cheaper than most proteins. The one vegetable that is "more meatier" than most is the humble eggplant. It's the mouth feel and creaminess that feels hearty. 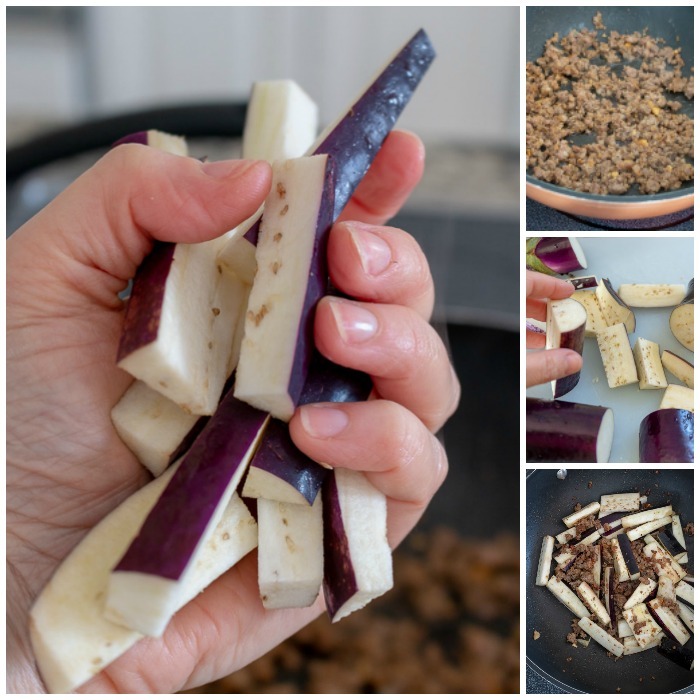 Another way we save a little money is to add mostly vegetables and just a little protein for flavor in dishes just like what we have done in our Chinese Eggplant with Spicy Pork recipe. As the grilling season upon us, be sure to try our Super Easy Grilled Asian Eggplant. 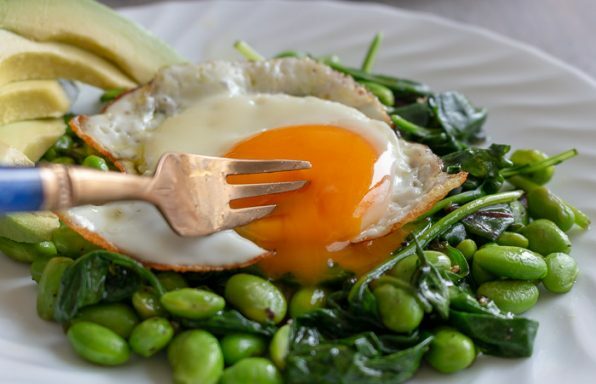 How many of you are doing the LOW CARB thing or a KETO diet or even a on a diabetic diet? 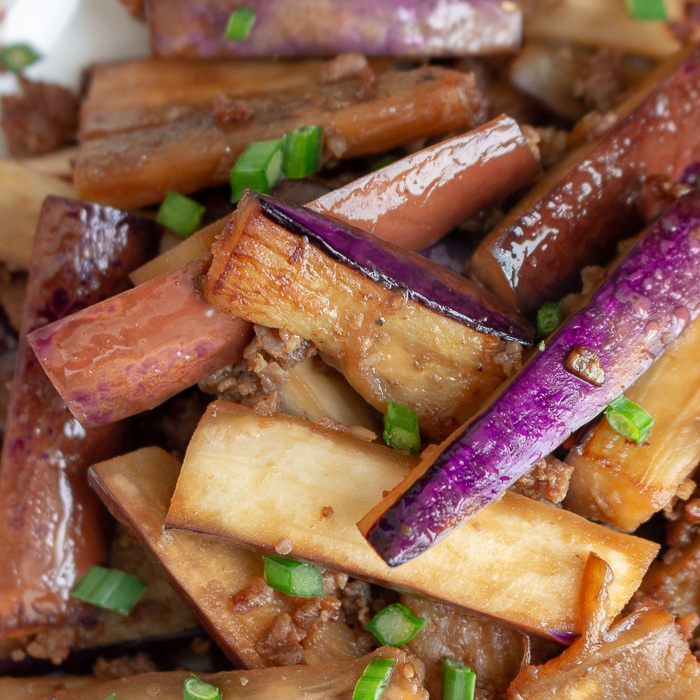 Our Chinese Eggplant with Spicy Pork is low in carbs. If you serve it with a side of cauliflower rice or just on it's own, it can be a delicious low carb idea for dinner. One thing that you will notice with all Asian cooking, there is a mix of flavors between the savory and the sweet. Almost always, you will see a pinch of sugar or sugar alternative in the recipe. 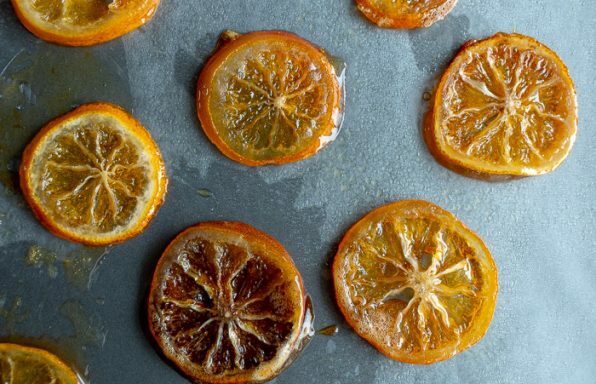 You can just skip the sugar or sugar alternative. 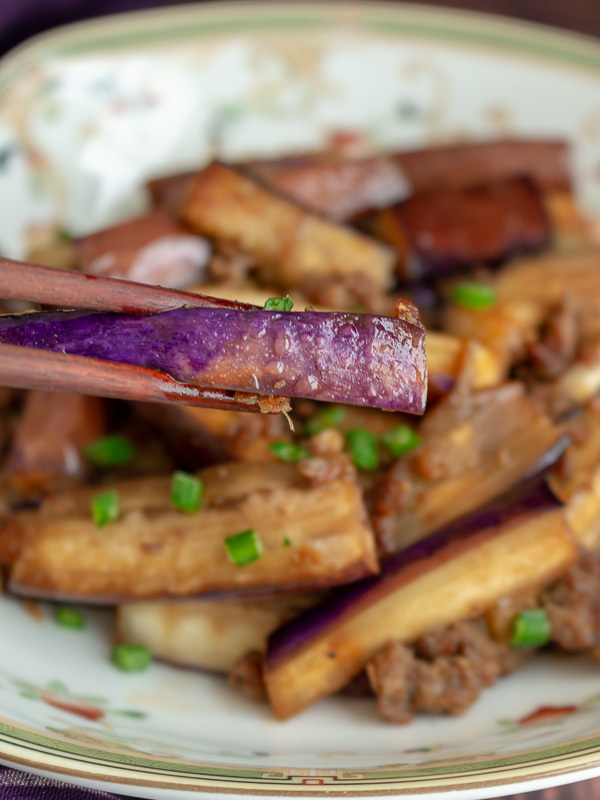 The Chinese eggplant is sweet on its own when it is pan fried and gets slightly caramelized. Eggplants soak up oil like CRAZY! They are kind of like mushrooms in that respect as they just soak up any moisture including oil around them. 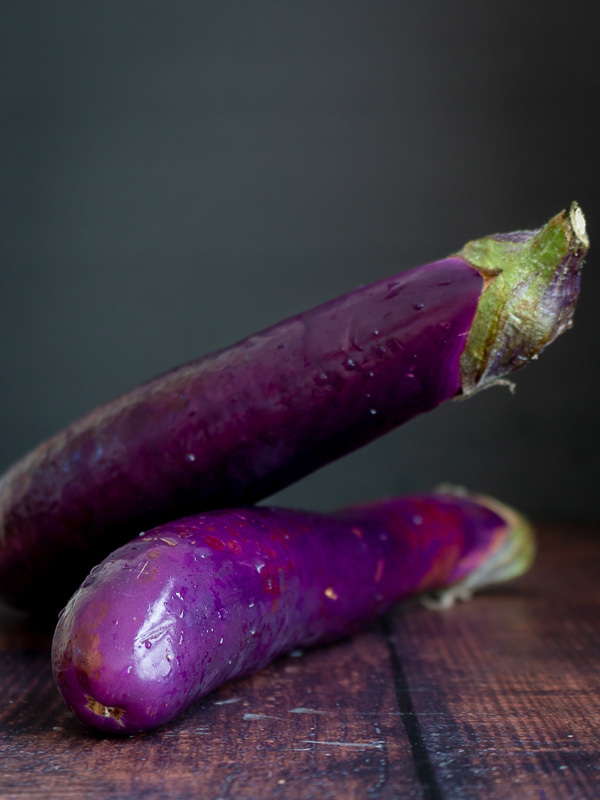 There are a couple of ways to cook eggplants. First you can flash fry them and then add them to your stir fry if you like for them to keep their purple color. However, what a mess! Deep frying is not our idea of fun. Instead, we cook the marinated pork and aromatics first. Then, we add a little of oil in the wok and pan fry your eggplant until they are slightly golden on the exterior and tender on the inside. You do not need a lot of oil to do this. However, you need a hot wok or hot pan. The juices and flavors for the pork and the aromatics permeates the eggplant and it is super delicious. There is only one down side to this. Sometimes your eggplants will turn brown from the heat of the pan, instead of all staying bright purple. However, we would rather have a healthy meal than for it to be downing in oil and purple. This is a very quick process that takes only a minute or two. Cut your eggplant just before tossing into your wok. Just like apples, eggplant will start to oxidize as they are exposed to air and start to turn brown. This oxidation will not affect the taste at all but of course we first eat with our eyes so presentation counts. How to tell if your eggplant is ripe or overripe? Some basic rules are to choose eggplants that are firm to the touch, bright purple and do not have any brown spots. If your eggplant are soft and have brown spots they may be older and this can make them slightly bitter. We also like our eggplants to be straight and not curved as this makes it easier for cutting symmetrical. However, as you notice today we have an eggplant that has an odd curve. That is okay because we would much rather have a firm ripe eggplant with a curve than a straight old eggplant with brown spots. Do you see the brown spots starting on the eggplant below. This is an example of an overripe eggplant. 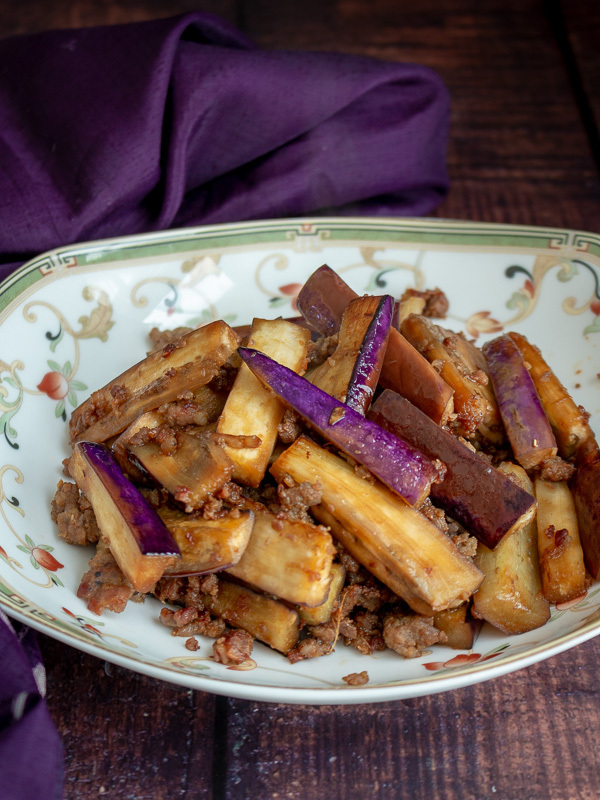 Chinese Eggplant with Spicy Pork is traditionally prepared with pork. However, we know that many of you may not want to use pork so feel free to exchange with ground beef, turkey or ground chicken. 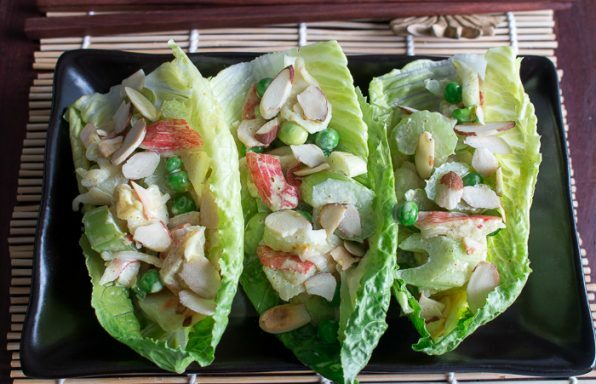 If you want to make this recipe vegan, exchange the pork with extra firm tofu or mushrooms. In order to make this recipe gluten free, use tamari sauce instead of soy sauce. You can use a dry sherry instead of Shaoxing wine. Essentially most everything except for Dark soy sauce and garlic chili sauce are available at a regular grocery store. You can obtain dark soy sauce at an Asian Market or even order it on Amazon. We like the depth of flavor for adding both but you can just use tamari or regular light soy sauce for this recipe. The other item that may or may not be in your local grocery store is Garlic Chili sauce. We go through this by the crate at our house a WEEK as the boys love it spicy. 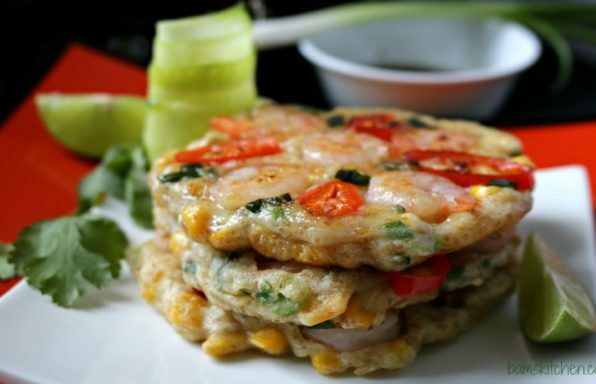 However, you can make your own La Jio Jiang minus the fermented black beans or exchange with a little sriracha sauce and extra garlic. 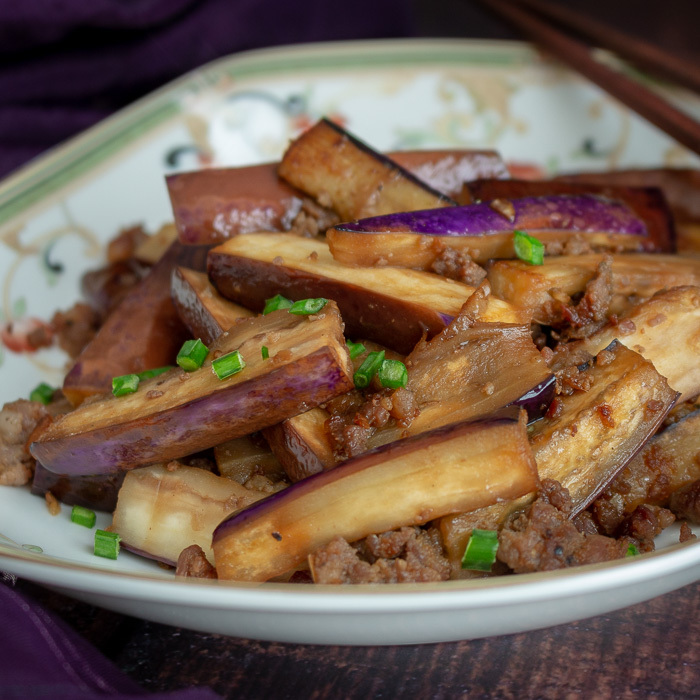 The great part about this Chinese Eggplant with Spicy Pork recipe is that you can make it as spicy or as mild as you like it. If you are a CHILI HEAD, be sure to try our Mapo Tofu , Spicy Garlic Cucumber Refrigerator Pickles or our Homemade Sichuan Garlic Chili Oil. Our mild Better than Take Out Chinese Recipes are just as delicious. Be sure to try our Clean Eating Shrimp Stir Fry, Easy Pork Shiitake Mushroom Stir Fry or our Top 18 Healthy Stir Fry Dishes. 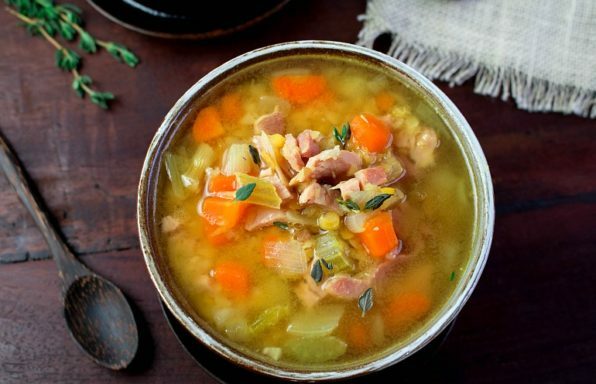 If you like this recipe, be sure to sign up for our newsletter to receive free recipes. 1Marinate the pork- mix the pork with , garlic, ginger, white pepper, sugar or sugar alternative (hold for LOW CARB) 1 tsp of light soy sauce, 1 tsp of dark soy sauce and and set aside. 4Put 2 tablespoon of oil in wok. Stir fry the marinated pork for about 2-3 minutes until browned. 5Saute the eggplant lightly for 2-3 minutes until lightly browned with the pork. 6While stirring the wok add the sauce mixture (light soy sauce, dark soy sauce and garlic chili sauce) into the eggplant and pork mixture just until blended. Add a teaspoon of sesame oil and toss, if desired. 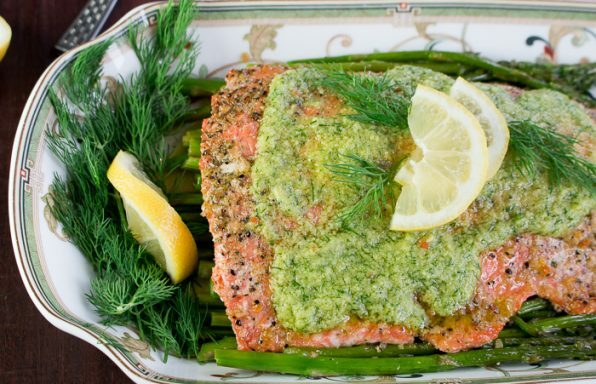 7Garnish with garlic chives or spring onions and enjoy!